← Can writing make my child a better reader? Although a “Simple View of Reading” (SVR) was proposed in 1986, its simplicity and success make it a useful tool to assess reading comprehension today. Almost thirty years ago, two researchers, P. Gough and W. Tunmer, suggested that reading includes two primary steps, decoding words (using phonics skills to figure out words) and language comprehension (knowing the meaning of words especially when words are strung together to form sentences). What does this simple formula mean? Reading comprehension requires the child to master two areas, decoding words and language comprehension. If a child can do one but not the other, or can do one better than the other, his reading comprehension score will be only as high as the lower of the two other scores. How can you use this Simple View of Reading to identify your child’s reading comprehension skills or lack of them? First, ask yourself: Is my child’s reading problem decoding? Is his problem language comprehension? Is he having problems in both areas? If you are not sure, test the child in both areas. You can test decoding by having a child read lists of real and nonsense words. Lists are available online. Having the child read nonsense words (e.g., zups, thab, slig) is important because some children memorize the look of a word without being able to sound it out. Also, to assess decoding, don’t use words from a reading passage because the child might figure out a word from the context. To test decoding, you must remove context. You can also test decoding by reading an unfamiliar passage aloud and asking the child questions about facts, main ideas, sequencing and paraphrasing . If he can respond accurately when he is the listener, yet he cannot do that when he is the reader, his problem could be decoding. You can test both decoding and language comprehension by having the child read aloud to you. (If he can pronounce words correctly, or in a few cases, use phonetic pronunciation for unfamiliar words, decoding is not his issue.) Stop and ask the child what various words mean. Ask the child to paraphrase a difficult sentence. Ask the child to paraphrase the passage. Ask the child to predict what might happen next. If the child can decode, yet he cannot explain what he has read, his problem is likely language comprehension. Teachers often see this situation in ESL students who learn the rules of phonics well but whose vocabulary in English is not extensive. To make the evaluation easy, use a scoring method of high, medium, and low based on your own mental tally from working with the child. 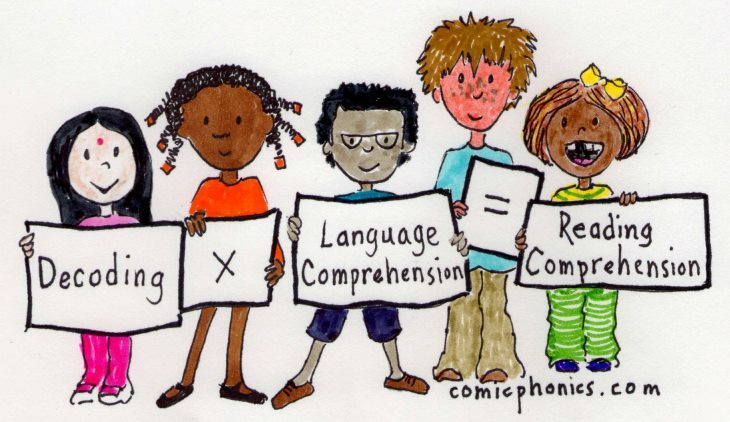 If the child scores high in both decoding and language comprehension, he probably does not have a reading comprehension problem. But if he scores medium or low in decoding or language comprehension, he has a reading comprehension problem. A medium or low score in decoding means he needs more work in phonics. A medium or low score in language comprehension means he needs vocabulary building, work on pronunciation, time listening to a native speaker read a text aloud, and strategies to gain meaning from sentences and passages. This entry was posted in English as a second language (ESL), phonics, reading comprehension, reading research and tagged decoding words, recording reading progress, Simple View of Reading. Bookmark the permalink.